Whenever I make anything, even a costume, I always try to think of ways that I can wear or use it again. When I made these jodhpurs, I tried not to rush or to think of them as being "just a costume". It is SO easy for me to fall into this trap, especially when I have a deadline. That's not to say that I wasn't rushed at the end of the project; I always seem to finish everything at the last minute, and there were a few things that I would have redone if I'd had the time. Here are some images from the '20s and '30s. 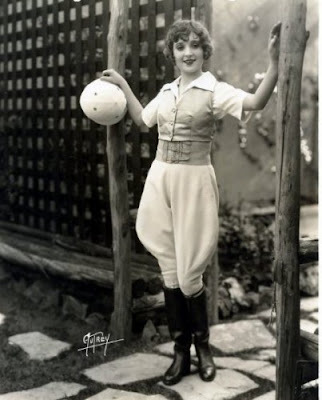 The first two are of real women wearing breeches (for some great pictures of a few Hollywood starlets in action wearing jodhpurs, check out this post from Baroness Von Vintage), and below them, an image of a pattern envelope and an advertisement. 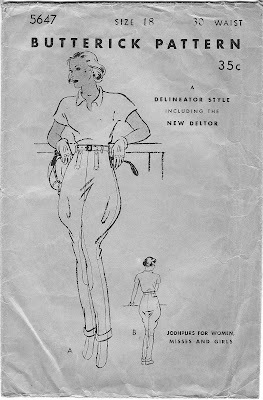 The description on this pattern calls them knickers and says that they are "suitable for General Sports Wear, Motoring, Riding, Motoring, Hiking, etc". This ad is one of my favorites; she looks so glamorous in her riding clothes! And the men in their work clothes, with their shirts buttoned all the way up and tucked in; most men nowadays (mine included!) don't look half this nice when they go out to dinner! I used the same fabric and vintage buttons as I used for my knickers. I am intending to make a vest to match someday, and I wanted to be able to wear it with both of them. I did make a few alterations to the original pattern. The pattern called for side pockets, which I eliminated; those kinds of pockets are never flattering on me anyway, and I thought that they would ruin the lines of the pants. I should have used some spray starch to stiffen up the sides a little; I think that if I had used wool or some heavier material, as the pattern called for, this wouldn't have been an issue. Please ignore my Peter Pan-pose here; according to my husband, I stand like this when I'm wearing pants. Weird. It was really nice to sew something completely unlike what I normally make. Here's a picture showing how the front flap works. It is supposed to be lined so that the buttons slide between a casing created between the lining and the fabric, I assume to prevent them from catching on anything. Again, though, as I most likely will not be riding a horse nor flying a plane in these, I wanted my vintage buttons to show. 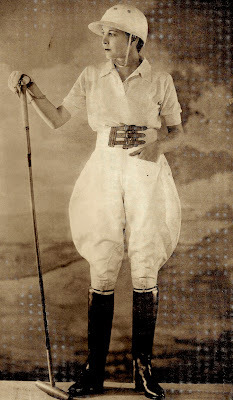 I love these jodhpurs, and as much as I dislike camping, I am really hoping for another chance to wear them! These are so awesome! 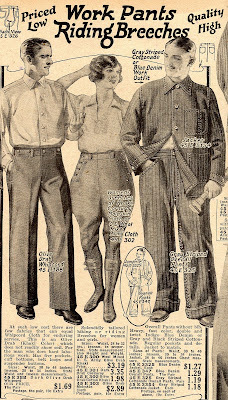 I've always loved jodhpurs but not been sure I'd dare to wear them if I eventually make a pair since they are quite far from any kind of trousers worn today, but you make these look so good I most definitely want to try! I love you and your awesome style. You pulled this off really great. Gosh! I really love that jacket and the boots. 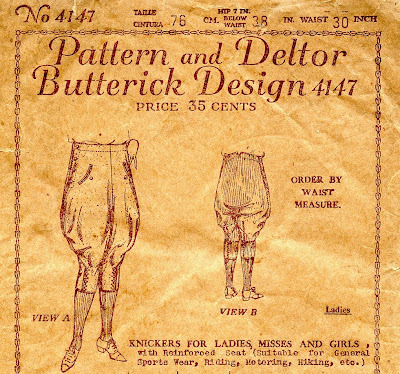 Ditto - where did you find the Butterick pattern? Adorable costume. I'm a huge jodhpur fan and yours are fantastic! Whenever I have been able to find a vintage pair they are wayyy too baggy in the rear. Yours fit dandy. Looks like I have to try my hand sewing my own - thanks for the inspiration. 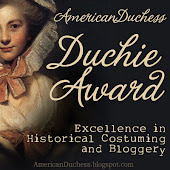 A Duchie Award For Me, and A Coupon For You!